There has been a surge in the use of wooden flooring in homes across the UK over the last few years and it’s easy to see why. Wooden flooring has innumerable benefits over other types of floor coverings and it simply looks great in any room where it is fitted. However, if you have a wooden floor fitted there are a few precautions you might want to take so the floor looks great for years to come. If mud, dirt and grit are brought into the house on the soles of your shoes, the tiny particles can scratch your wooden floor. However, if you use good quality entrance mats, such as turtle mats, at every entry and exit point the dirt can easily be wiped from your feet and any moisture will be trapped within the mat so that your floor isn’t damaged. If you use protective cups or pads on the feet of furniture these won’t damage your floor surface when the furniture is moved. Even though furniture should be lifted clear of the floor surface before it is moved it’s quite common to be dragged across the floor. If this happens the floor will be scratched if the furniture feet aren’t fitted with any protective pads. Different types of cups and pads are available, some which can adhere to the furniture feet and some which need to be carefully placed under the feet. Most people with wooden flooring choose to accentuate the floor by using a rug on the floor surface. 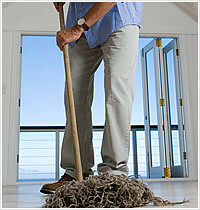 Although this can look great, permanently covering a section of the floor can cause problems when the rug is removed. Your wooden floor will change colour slightly over time due to the natural ageing process and the affects of sunlight. For this reason it’s always a good idea to move furniture and rugs around the room from time to time. 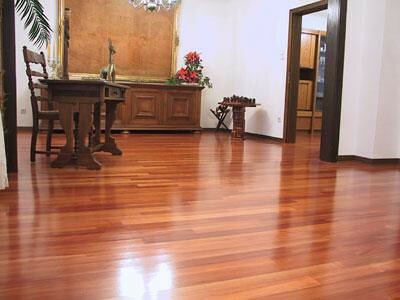 Regularly cleaning your wooden floor can lengthen the time between resanding. This is because all the dirt and dust is removed so the surface is less likely to be scratched. The easy way to clean a wooden floor is to vacuum first and then mop the floor (with a well rung out mop) so that the surface is sparkling clean. You can buy wooden floor cleaning products which you can add to your cleaning water to give the floor a nice sheen whilst not damaging the surface coat. It’s worth remembering that if you have a real wood floor simply sanding the surface and applying a new finish coat will make the floor look like new. This article about protecting wooden floors by using things such as turtle mats was written by John Rogers on behalf of www.flooring.uk.com.